Posted 18 February 2014 & filed under 1980s, 1990s, People, Places and spaces, Uncategorized, Work. 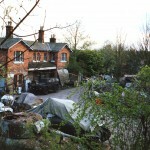 The yard of the disused London Road station near where Orient Close is now, was home to a collection of army surplus vehicles owned by Chris Wilkinson. The vehicles were used in many films, television shows and local events. 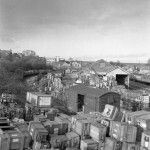 Rob Tillotson was given a job at the yard in the early 1990s and was able to caption in detail some of the photos shown below. M4 Sherman tank that appears at the end of the film, Saving Private Ryan, and will also be appearing in the new Brad Pitt movie. 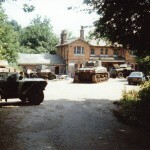 The four vehicles behind it are mark 5 Humber armoured cars, as is the back end just in shot on the left. Probably before 1993. 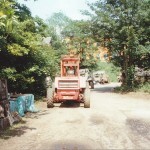 The fork truck in foreground. 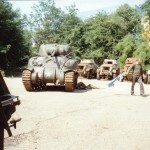 The Sherman tank at the rear was sold in 1993 to a buyer from the Netherlands. Also in shot are several Humber armoured cars and a Daimler armoured car. 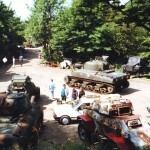 Front left is a Daimler Dingo scout car, behind that on the left is another Humber armoured car. The next one is a Daimler armoured car. 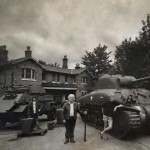 In the middle is the Sherman tank,. The next one is another Humber armoured car, this was road registered and was taken to Harpenden along with the Sherman for the VE day parade in 1995. The blue Vauxhall Cavalier was Chris Wilkinson’s daily drive. Chris Wilkinson plus tanks 1980s courtesy of Simon Wilkinson. 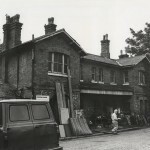 The picture was taken for a feature in the Sunday Times magazine about disused stations.